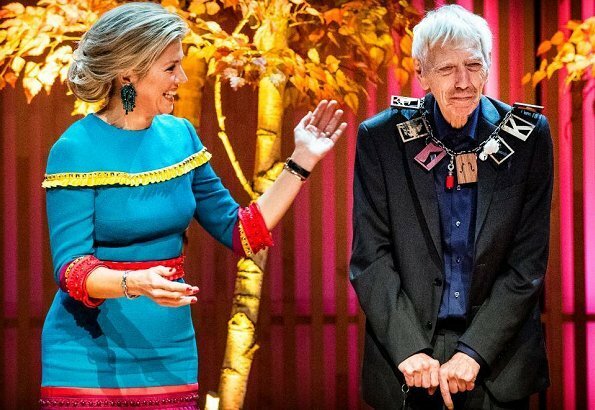 Dutch Queen Maxima presented 2018 Prince Bernhard Culture Fund Prize to Dutch conductor, pianist and composer, Reinbert de Leeuw with a ceremony held at IJ Music Building (Muziekgebouw aan 't IJ) in Amsterdam. De Leeuw is a well-known conductor and pianist who performs mainly contemporary music and since 2004, he is a professor at the Leiden University. Every year, Culture Fund rewards people or organizations that have made great contributions in fields of culture, nature or science. 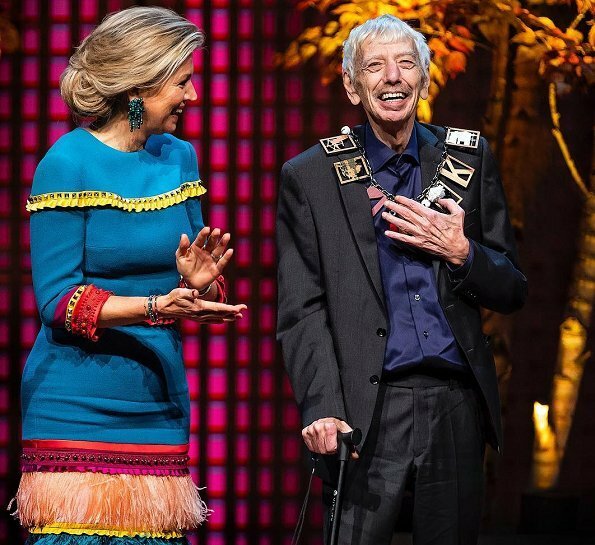 The prize has been presented by Queen Maxima since 2010. That is obviously a carnivals costume what she is wearing, isn't it? Carnival was my first thought. Maybe she thinks she's in Brazil! This dress is really special, I guess it would be quite nice without that flattering stuff down there (can't describe it better in english). But in the end, the price seems to have a special price too, so the dress is maybe not that bad for the occasion. What I really love is this dark petrol colour in the dress, my favourite colour! Oh my....she looks like a pignatta! This is one of Maxima's worst dresses. It looks like someone found some old drapes and made a dress from pieces of them and the fit around the stomach is way too tight, just not flattering at all. To find something positive...I do like her earrings and her hair is styled very nicely. Why is she dressed in a kitsch lampshade? A rather tight lampshade at that. Very strange dress to me. Something about it reminds me of a Cuban traditional dress or something along those lines? ?It does seem to suit Maxima's vibrant personality though. I'm not a fan of it. Cela lui arrive de plus en plus souvent. Mon dieu que c'est moche . Ridiculous outfit. I don´t mind the cheerful colours, and I could live with both the shoulder thing and the sleeve embellishment. Defined waist is good too. But then, further down, the designer totally lost the plot. Fantastic Maxima. She is doing things in her own way. You don't have to take your life, at least not your outfit, so seriously all the time. Parece uno de esos trabajos manuales que los nenes hacen en la escuela...que horror!! I like the dress, there is something theatrical about it. But not for her, she has a conservative bodytype, hair style general appearence and then comes out with this kind of outfits that end up looking like a costume on her, Its a pitty for her that has the chance to hose to wear more apropiated outfits, for the disegners that dress her, en fin,,, her hair is fijn. Waist down, it's like an african costume. I do believe people are missing the point here. This dress was made by these people. Look at the girl trying something on similar in design to what Maxima is wearing. That´s a photo from the fashion label promoting the design. 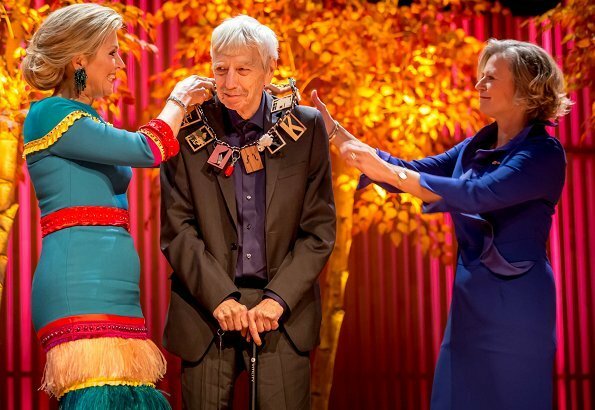 Has nothing to do with Máxima´s event. 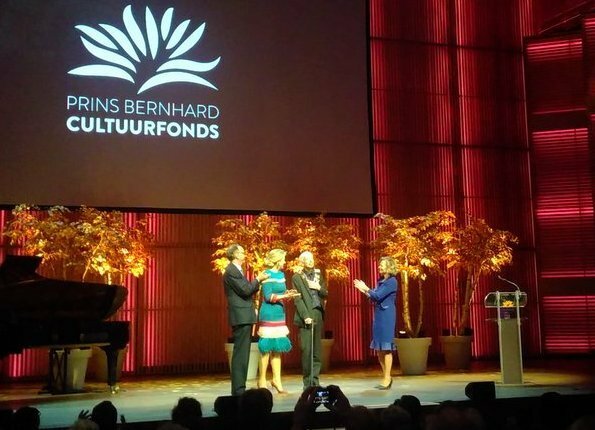 She is awarding a prize (the Prince Bernhard culture fund prize) to a conductor, pianist and composer. 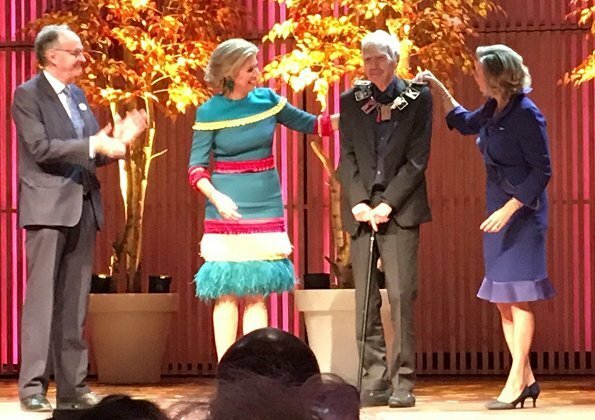 If it was a fashion-related event, along the lines of awarding a prize to a dutch newcomer or something, I´d understand if she wore a prize-winning design, even if odd. But since this culture prize has nothing to do with fashion, I feel that her strange outfit is too attention-grabbing (the prize-winner should be the star of the show) and is (by looking so ridiculous) almost disrespectful to his achievements for which this prize is awarded. I also totally agree with Vanessa. This outfit is not only almost disrespectful to the prize-winner but also to the country she represents. If there's anyone who can have a bit of fun with her wardrobe, it's Maxima. Clearly the dress matches the coat shown on the model, and Claes Iversen is a designer that she often supports. No better place to wear something playful than at a culture festival recognizing the Arts. Look at the award being put around his neck after all. Good for Maxima for getting into the spirit! Il faut sauver la reine Maxima. Il y a une lente dégradation depuis plusieurs mois dans le choix de ses tenues. Celle-ci est horrible. Je ne crois pas avoir quelque chose de plus inapproprié et de mauvais goût. Comme d'autres l'ont écrit, carnaval, arbre de Noël. N'importe quelle couturière débutante ferait mieux. Ce "créateur" est un usurpateur et n'a aucun talent. Que l'entourage de la reine lui fasse prendre conscience que ses choix sont essentiels, que supporter n'importe qui, la dessert et qu'elle devrait très vite avoir de plus belles tenues en rapport avec sa fonction. OMG what am I seeing but I do believe now after reading the last post that this was made by the people she is visiting. It is horrid though. One of those "anonymous" posters complained in another post about me critizising Maxima's hair and clothing. How could I not??? Look at what she's wearing here! it's too tight and ugly, terrible. Nin Pujol, you are right. Fashionwise I just want to say, well: "Words fail me..."
Great hair and makeup. Let’s not talk about the dress. But isn’t it so cute that she seems so satisfied with it. She's Argentinian but the queen consort of a European country. I very seldom like what she's wearing, she goes to too much extremes. I think you are being a bit unfair. Most of Mathilde's recent outfits have been smart and Letizia continues to be smart and elegant (if rather dull of late) It really is only Queen Max who has turned out in some truly amazing (in all the worst senses) outfits. Little bit too late to celebrate Cinco de Mayo . Ha, that the first thing I thought of when I saw the dress...piñatas came to mind! I think the colours suit her. But it's... well, typically Maxima. And over the top. And yup, it's way too tight. Shame, 'cause she has a beautiful figure. This is not a Natan dress, but I am wondering if I am the only one who often sees that her Natan dresses, tops and skirts are too tight either? I’m from Holland and check this blog almost daily, but my English won’t be perfect ;-) But that is not a problem, is it? No no no, never again! Hair and makeup very pretty! Ridiculous and awful, even for Maxima. Rosalyn, I agree with you. Again and again the Queen suffered illnesses and did not recover really. Wilhelm Alwxander is for shure aware of everything and is taking care. Only Maxima can pull this off, the color of the dress is nice but the rest is I really don't know what? Like her hairdo and shoes!. I don't think Maxima's health problems have anything to do with her ability to choose clothing. And this is principally a fashion blog so people will criticise the clothes.